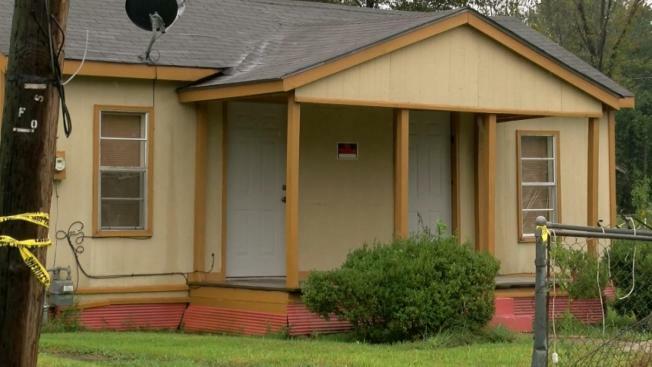 The death of a 20-month-old girl found stabbed and burned inside an oven of a Mississippi Delta home led to a murder charge Tuesday against the child's grandmother, authorities said. Bolivar County Sheriff Kelvin Williams Sr. said 48-year-old Carolyn Jones was charged with first-degree murder in the death of Royalty Marie Floyd in the town of Shaw. "I've been doing law enforcement for 25 or 26 years now," Williams told The Associated Press. "This is one of the most horrible things I've seen in doing law enforcement. The hardest part ... is to see a child victim." He said authorities had no immediate answers in the death of the woman's granddaughter. Jones made an initial appearance Tuesday evening before a judge, who set bail at $500,000. Jones remained jailed and it wasn't immediately clear if she had a lawyer who could speak for her. Sheriff's officials said Floyd lived with Jones while Floyd's mother lived elsewhere. Williams said Jones' brother found the body Monday night and called police in Shaw, a town of about 2,000 people approximately 100 miles (160 kilometers) northwest of Jackson. Police, in turn, called the sheriff's office and others for assistance. Spokesman Warren Strain at the Mississippi Department of Public Safety said investigators are still probing for the cause of the girl's death, as well as when exactly the girl died and whether that was before she was placed in the oven. The child's body has been sent to the state Crime Lab in Pearl for an autopsy, though Williams said autopsy results were not yet complete on Tuesday. Jones was arrested when police arrived at the home and held overnight for questioning while charges were readied, the sheriff said. "That was the only person who was there with the child at the time," Williams said. Authorities said they had no immediate information about the circumstances leading up to the child's death. "That's hard to say," Williams said. "We don't know." He added, "Dark days such as these can only be brightened when justice is served." The sheriff said the murder charge was filed after consultations with Bolivar County District Attorney Brenda Mitchell. Mitchell didn't immediately return a phone call and an email seeking comment Tuesday. The child was found inside a beige frame house in the north end of Shaw. Police tape still surrounded part of the house Tuesday morning, while a stroller, a high chair, and a trash barrel of toys including a scooter sat near the curb in front of the house. Williams said those toys had belonged to the child. Neighbors said they rarely saw anyone coming in and out of the home. "It's a baby. It's an innocent child. She didn't ask to be here," neighbor Tomorrow Williams told WMC-TV. A woman in Greenville, about 20 miles (32 kilometers) from Shaw, pleaded guilty to killing her 3-year-old son in a heated oven in March 2011. Terri Robinson pleaded guilty to murder in 2012 in the death of Tristan Robinson. Washington County Coroner Methel Johnson said an autopsy found Robinson had died from heat injuries sustained in an electric oven.